When most people think of a wine cellar, they think of the aesthetic: a grand door, gorgeous wooden racking, perhaps a piece of wine-themed artwork. And of course, these aspects of your wine cellar are incredibly important; they’re what make it fit seamlessly in the design of your home, work with your lifestyle, and put a stamp on your cellar that’s uniquely yours. But one of the most important parts of a wine cellar is one that’s entirely behind the scenes: the cooling system. 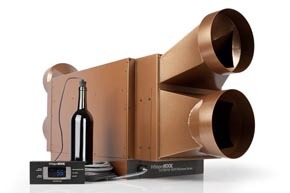 Wine cellar cooling units are much more than air conditioners. They control not only temperature, but also humidity. They are specifically engineered to create the ideal environment for preserving and aging wine. The best wine cellar cooling units not only control the environment, but constantly monitor it, allowing you to see at a glance that your wine is being taken care of. Gentle cooling: Most air conditioning systems blast the room with a stream of freezing-cold air. But this kind of extreme temperature can interfere with the delicate wine aging process. Breezaire cools by using a gentle stream of cool–not cold–air, which keeps the wine protected from abrupt temperature changes. 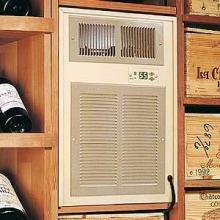 Automatic humidity control: Humidity is vital to a wine cellar. The proper level of humidity helps prevent label deterioration, and more importantly, cork deterioration, which can ruin your wine. 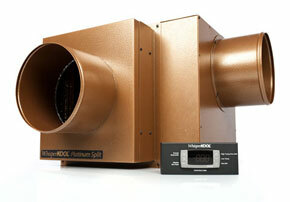 Breezaire systems maintain humidity at an ideal level of 50 to 75 percent. Quiet operation: Your wine cellar should be a place you enjoy being. A noisy cooling system can ruin your sense of peace and tranquility. Beyond that, vibrations–even those too small for a human to detect–can interfere with your wine’s aging process. Breezaire systems are assembled by hand and tested to ensure that the level of noise and vibration is kept at an absolute minimum. Simple and elegant installation: Breezaire systems are designed to require no special plumbing, wiring, or complicated procedures to install. 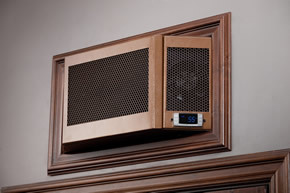 Once installed, Breezaire systems are design to sit flush with the wall, and are virtually unnoticeable. Expert support: Installing a cooling system can be tricky. Breezaire has a team of experts equipped to design the perfect system, problem-solve, and maintain your system far into the future. Interested in building the wine cellar of your dreams, complete with a cooling system that will help you build the wine collection of your dreams? Contact a Vintage Cellars expert to talk about the best options for you. Curious about the process of building a wine cellar start-to-finish? Today we’re showcasing a new 800 bottle contemporary wine cellar we built in La Costa, California. The client, Don, presented us with a challenge: convert a study in his new home into a wine cellar with a unique design. Read on to find out how we did it. Don started collecting wine about six years ago and developed a love for California cabs. He began taking yearly wine tasting (and buying) trips, and wanted to start coming back with more wine but had nowhere to store it. It was time to get serious about his collection. He began his search for a wine cellar builder, came across Houzz and found Jake and Vintage Cellars’ work. Don sent Jake a look at the model for his new home and explained that he wanted to convert the study into a cellar. He also wanted to be able to easily pick out a bottle visually, so the labels had to be prominently displayed. Jake drew up a couple of designs, and came up with one that suited Don perfectly: a contemporary space completely different from your standard wine cellar. Since the original room was a study, it wasn’t built for the challenges of storing wine in climate-controlled conditions. Jake and his team re-insulated the walls to ensure that the new cooling system would perform at its peak. They designed a custom cabinet to seamlessly fit the study’s curved wall. They installed a Vintage View wine racking system that displayed the majority of his collection labels-out, making it easy for him to locate the perfect bottle for a dinner party or cozy night at home. Their 800-bottle racking system also left space for storing larger bottles, and shelf-style racks below for storing bottles in larger quantities. Lastly, Jake recommended Don use a door made to face outdoors in the cellar to keep the room insulated. Jake and his team finished off the project with a central bar area, complete with wine artwork. Though Don never imagined himself lingering in the cellar, at the behest of his friends, he now finds himself turning off the cooling system for an hour at a time so that he and his guests can relax there! What was originally intended as a study is now a beautiful space that functions not only as a place for storing Don’s growing collection, but also as a conversation-starter and gathering space. 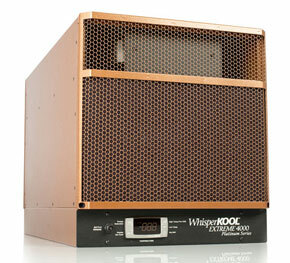 Vintage Cellars is proud to now offer WhisperKOOL SC Series Cooling Systems. 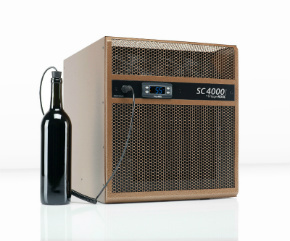 The SC Series, which replaces WhisperKOOL’s popular XLT Series, offers wine collectors the latest in wine cooling technology, providing both quality and value in durable wine cellar cooling units. Having incorporated feedback from WhisperKOOL customers and installers, this new line of wine cellar coolers includes an updated housing design and the latest system technologies. The new SC Series comes in five models: SC 2000i, SC 3000i, SC 4000i, SC 6000i, and SC 8000i. 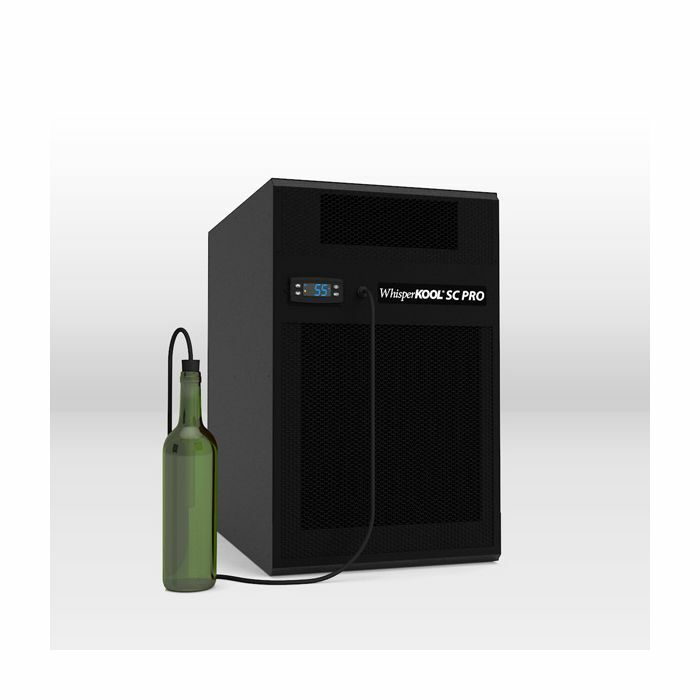 Contained within the compact structure of the WhisperKOOL SC Series is highly powerful and sophisticated wine cooling technology. The SC Series offers vibration-free cooling for up 2,000 cubic feet of storage space while maintaining a 30°F temperature differential. Furthermore, the SC Series’ advanced digital controller and liquid temperature probe ensures that a stable temperature is maintained for the bottle contents rather than the air in the room. One of the most outstanding features of this new line of wine cellar coolers is its convenient installation. The SC Series compact structure fits perfectly between standard wall studs, reducing installation time and costs. To learn more about the WhisperKOOL SC Series wine cooling system, check out our brand new SC Series page. If you’d like assistance in selecting the best unit for your needs, please call us at 1-800-876-8789.